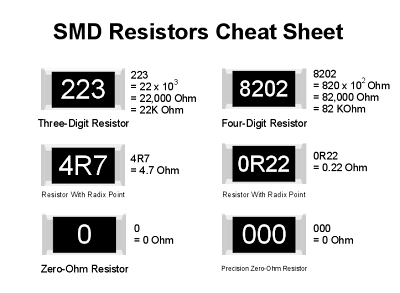 Here's cheat sheet for reading SMD Resistors that I came up with recently. If you have trouble reading these components, try using a magnifier. Here's the link to view it. If you think you can't solder these think twice, these are actually pretty easy after you practice a couple of times. Here's an 8-part tutorial from the folks at Sparkfun Electronics.